The team from Le-Ba Boardriders have beaten Australia’s best junior surfers to win the 2015 Vissla Junior Kirra Teams Challenge at Duranbah Beach, yesterday. In clean 3-4ft waves at D’bah’s off the wall bank, Le-Ba‘s all-star team of Zac Whitemen, Jack Murray, Mikey McDonagh, Hunter Weston, Jake SnellGrove, Luke Condon, Eli Carr & Jack O’brien were too good for their rivals, besting Snapper, Burleigh, Merewether and Kirra who finished 2nd to 5th respectively. Le-Ba finished with six heat wins, one second and one third to amass a 29-point winning total. 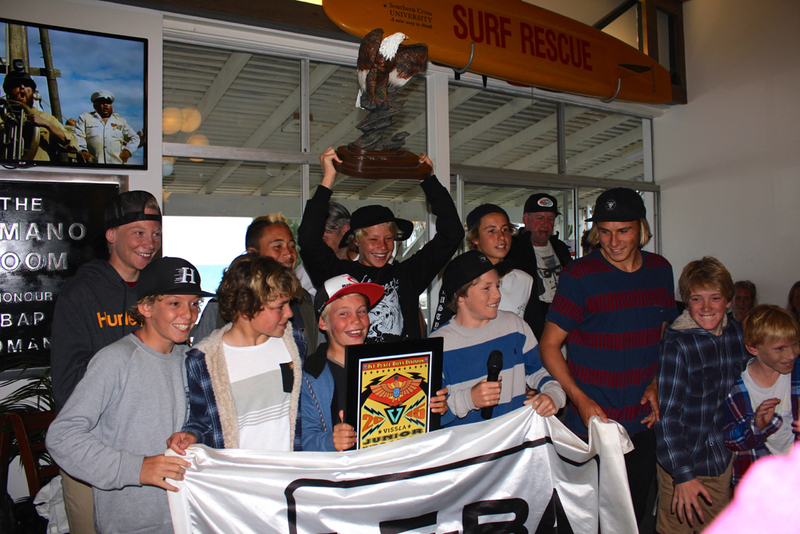 The Le-Ba club won $2000 prizemoney from the Kirra Surfriders Club for their efforts. The Kirra orange team of Max Tobin, Blaine Robinson, Seth Johnson, Gabe Ley, Kai Pickard, Lucas Zions, Codie Jeffrey and Jack Wilson started off strong with 3 wins and a 2nd out of 4 heats on day one and were one of the leading teams coming into the 2nd day with some very close final round results seeing Kirra finish equal second, with Snapper for number of wins (5) but placing 5th overall after the other 3 heat results were counted. More 192 surfers from 24 boardriders clubs from Queensland and New South Wales competed in the main event, which follows the same format as the Kirra Teams Challenge with each club submitting teams of eight including two Under 12 Surfers, two Under 14 surfers, two Under 16 surfers and two Under 18 surfers. The Vissla Junior Kirra Teams Challenge 2015 is proudly supported by Kirra Surfriders Club, Surfing Queensland, Triple X, Rainbow Bay Surf Life Saving Club and GC Surf Magazine. 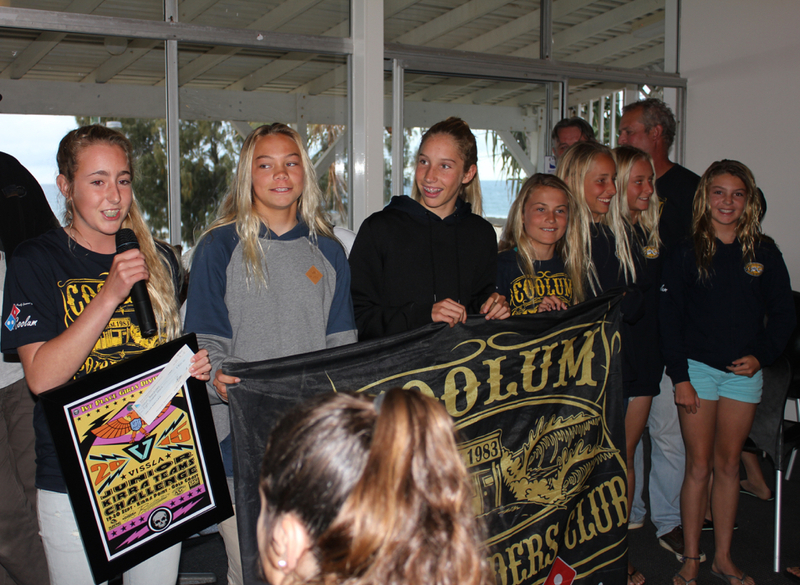 In the Girls Division which was surfed on Saturday 19 September, 2015 at Kirra, the girls team from Coolum Boardriders were victorious, beating close rivals MNM Girls into 2nd place.